Adds laser-resistant aliens, who counter laser turrets. Also adds fire-resistant aliens, who counter flame turrets. They will put some pressure on your base defense. This mod will not do much like an overhaul enemy mod, but will put some pressure on your base defense, forcing players to have well-thought base defense having turrets of more types. Players know to pick the more powerful turrets and weapons, it would be natural for aliens to do something similar. Biology studies indicates that Earth creatures had lots of mutation to adapt to changing climate and environmental conditions in the past, in order to survive better. So why can't the aliens adapt too? The cockroach-like biters and spitters are likely to mutate and/or evolve to their benefits, at least much better than any kind of mammals. In response to human laser turrets overwhelming aliens, the aliens now have a mutated variant of biters, code name "Mirror". Mirror aliens are completely immune to laser and electric (configurable in options). They would pose a high threat to your base, if your base defense has nothing more than laser turrets! You will need something extra to deal with them, like gun turrets. If your defense already consists of diverse types of turrets, this mod probably pose little threat to you. There are two mutation types: "Mirror" and "Ceramics". Both mutations only happen to big and behemoth aliens, so only affect mid to late game. Small and medium aliens do not have such mutations. Mirror is the codename for those aliens who have grown with laser and electric resistances. They will draw away fire from your laser turrets, covering the trailing aliens to close in. By default, the resistance values are both 10 / 100%, meaning they are completely immune to laser shots from laser turrets. The chances of mirror mutation are 20% (0.2) for big aliens, 30% (0.3) for behemoth aliens. All these values are fully configurable in options, under "Options" → "Mod settings" → "Startup" tab. These aliens are weaker (lower health, about 90%), however, than their ordinary variants. So they will die quicker if dealt with alternate turrets. Ceramics is the codename for those aliens who have grown with fire resistance. They will draw away fire from your flamethrower turrets, covering the trailing aliens to close in. By default, the resistance value is 10 / 100%, meaning they are completely immune to fire shots from flamethrower turrets. The chances of ceramics mutation is 5% (0.05) for big aliens, 10% (0.1) for behemoth aliens. All these values are fully configurable in options, under "Options" → "Mod settings" → "Startup" tab. Dealing with mirror aliens needs a bit of consideration, than just simply a wall of laser turrets. Gun turrets have their dedicated damage upgrade, dealing insane damage even with just piercing rounds magazine (red ammo). They also outrange behemoth mirror spitters a bit (18 vs 16), so they are they probably the most effective in stopping mirror aliens. If you play in death world (or with some mods) that have a very large group invading, flamethrower turrets will be very effective in weakening them. Dealing with ceramics aliens is lesser problem though. Flamethrower turrets may get distracted by them, but a few laser turrets and/or gun turrets should deal with them quickly. Dealing with mirror aliens would be a big problem, since many players are currently relying on the vastly overpowered personal laser defense in their equipment grid. Now you will need to use your main gun actively to kill them. If you want kind-of automatic fire to stop mirror aliens from getting close to you, a recommendation is to have ammo-consuming defense equipment installed on your equipment grid, which is provided by my mods Schall Tank Platoon and Schall Gun Pod. Such type of equipment is called "gun pods", which are excellent in close defense (and offense). Dealing with ceramics aliens should not be a problem, since most weapons are not of fire type, and actually kills them slightly faster than their ordinary type. If there is another mod removing the vanilla biter spawner and spitter spawner, this mod will simply do nothing (and should not crash). 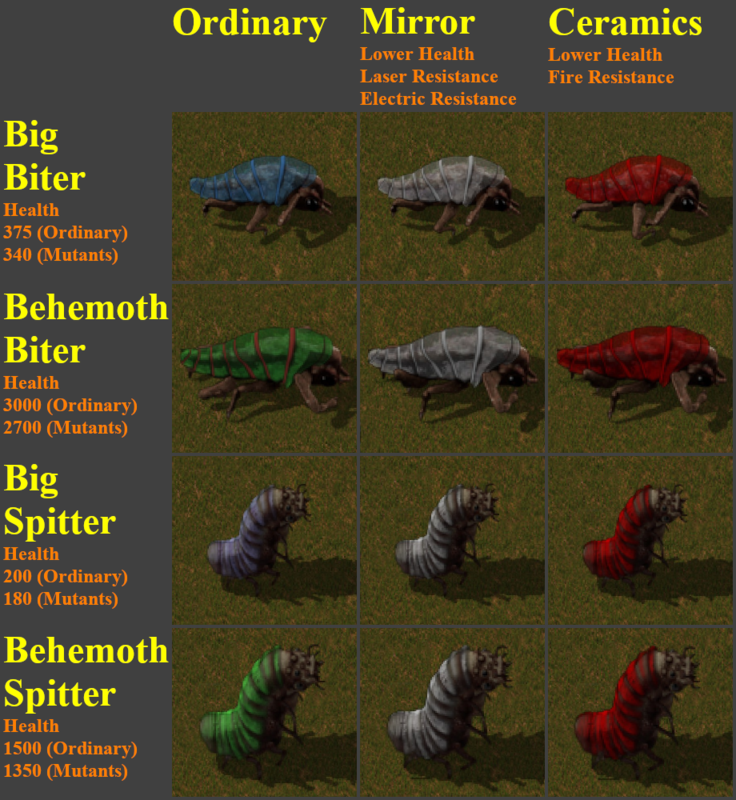 If there is another mod removing the vanilla big/behemoth biter/spitter, this mod will still add the mirror/ceramics biter/spitter. If there is any unintended behaviour, please report in Discussion section.